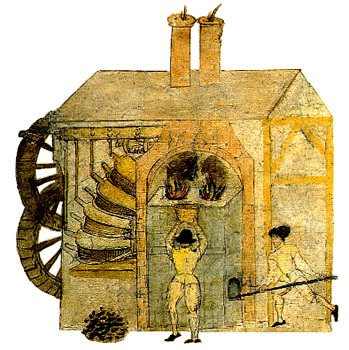 hen Frobisher returned from Meta Incognita in 1577 with 160 tons of ore, it became obvious that larger and better refining furnaces were needed urgently. Some assayers were blaming the inadequacy of existing facilities - their own small furnaces and a modest furnace-house at Tower Hill - for their failure to extract the quantities of precious metals believed to be in the ore. The 1578 voyage was planned on a much grander scale, and the amount of ore expected to be returned necessitated a large smelting works at a convenient location. The Commission appointed by the Queen to oversee the Meta Incognita venture decided to build a refining complex, the largest one in England to that date, on a royal manor at Dartford, situated on the Thames not far from London. Construction took place over the summer of 1578, being completed a few weeks before the return of the third expedition. Jonas Schutz had been appointed assayer-in-chief and designed the ambitious ore-processing works; the Commission was not happy with the cost estimates but had little choice than to trust Schutz that the expense was necessary to ensure results. The Dartford complex was made up of two large workhouses, two water mills, five large furnaces, a coal house and other smaller workhouses. The new furnaces proved no more successful in extracting gold and silver than those used previously; Schutz's design was blamed. In 1580, two assayers from Keswick were asked to evaluate the effectiveness of the Dartford furnaces. They attempted to refine lead and copper ore without success. Citing problems with the construction of the furnaces and the placement of the bellows, they were unable to offer any simple solutions. By now, however, it was appreciated that the ore itself was worthless. The building of the Dartford works had placed an added burden on the resources of the investors, contributing to the venture's financial collapse. By 1586, the Dartford complex had been sold for other uses, as an attempt by the Queen and the Meta Incognita adventurers to recover at least a little of their lost investment.